Featured photograph, above: David T. Oswell, ca. 1900. Photographed by William Bullard. Courtesy Frank Morrill, Clark University and Worcester Art Museum. SOUTHBRIDGE – A collection of rare historical photographs of African Americans in Worcester at the turn of the 20th century will visit Southbridge for the month of February. The collection is unique among similar known collections in the United States due to confirmed historical knowledge of the names of those pictured and the quality of the photography. It is presented by Frank Morrill, who currently owns the collection and is responsible for bringing its stories to the descendants of those photographed and to the public at large. The whole collection, which will be sampled in an exhibit at Jacob Edwards Library, contains more than 240 images of people of color in Worcester in the late 19th and early 20th centuries, “within the first four decades of having obtained their freedom” from slavery. The strikingly clear images of former slaves and their children were recorded by William S. Bullard in Worcester between 1894 and 1917. Bullard lived a unique life and left a lasting legacy with this collection. (Click here for an overview of Bullard’s life and his photography by Frank Morrill). Bullard kept a coded log of the names of the people he photographed, which contributed to a historical legacy that was not fully explored until generations after the photographer’s and subjects’ time. One of the unique sources of value for this collection is that descendants of those photographed – former slaves and the first generations of African-American born free from the horrors of slavery – have gained access to photographs of their ancestors. “The negatives themselves are unique and exceedingly rare in that the sitters can be identified. It is a great gift to history and to the future generations of his sitters that he would never have realized,” Morrill writes. Bullard, who died of suicide in 1918, did not live to see the legacy and historical value that his photographs would have for the descendants of those he photographed. The Bullard collection was exhibited at Worcester Art Museum from October 2017 to February 2018 in a show called Rediscovering An American Community, through a partnership between Morrill, Clark University and Worcester Art Museum. During Morrill’s ongoing research and at the opening event for the Worcester Art Museum exhibit, many of the descendants of the African-American people in the photographs were able to either share information about their ancestors or see images of their ancestors for the first time. Oswell’s great grandson Raymond Jackson is also an accomplished musician. 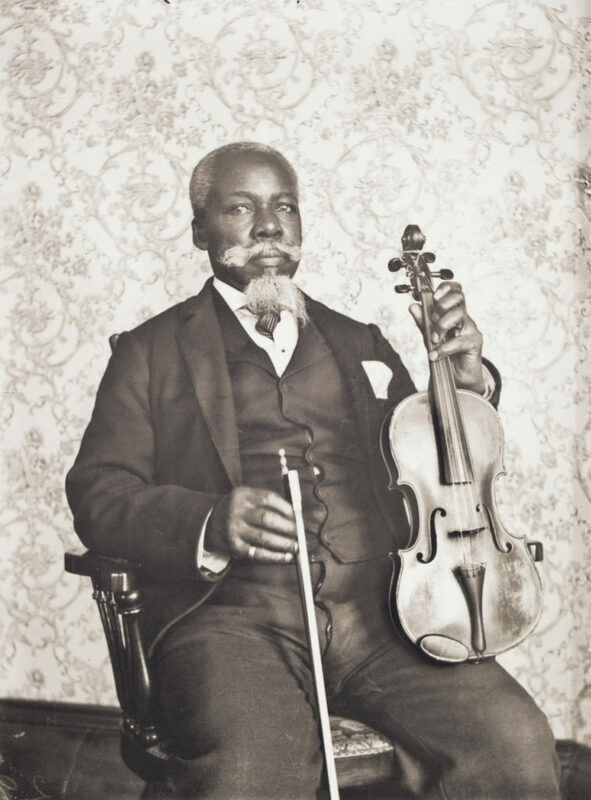 Jackson was aware of his ancestor’s musical accomplishments, but had never seen a photograph of Oswell until the collection was catalogued by Morrill. Jackson is an internationally known concert pianist and a retired professor at Howard University who lives in Maryland. Morrill and a colleague visited Jackson and his wife Inez three years ago to show him a photograph of Oswell, years before the exhibit at the Worcester Art Museum made the photographs available to a wide audience. Musician and academic Raymond Jackson stands near a portrait of his great grandfather, musician David T. Oswell. “He was thrilled as he was unaware that a photograph of this man that he idolized and respected greatly, even though he never got to know him, existed. It was a most touching moment as he was quite moved to see the photo. It is moments like that that have made the last five years so incredibly rewarding for me,” Morrill reflects. Oswell was born in Boston and moved to Worcester from Canada in 1877. Many of the people photographed, however had moved to Worcester from Camden, South Carolina, where they had been held in slavery by James Chestnut of the Mullberry Plantation. Chestnut was a United States senator who later became an aide to Jefferson Davis. Chestnut owned more than one plantation and held approximately 500 slaves on those plantations. Those seen in the Bullard photographs includ Rose, Edward and Abraham Perkins, who were some of the earliest migrants to Worcester from Chestnut’s South Carolina plantation, arriving around 1880. According to Morrill, the area in Worcester that they settled, the Beaver Brook neighborhood, was referred to as “Little Camden” as a result of the migration from South Carolina. Rose and other African Americans in Worcester were among the children of King Perkins, a man who was kept in slavery by Chestnut until his death at the age of 110 in 1912. “Researching these negatives has allowed me to meet many descendants and be able to help them see, through photographs and research, a part of their history that they often did not know existed, but more importantly it has allowed me to learn, gain a better historical understanding and to make acquaintances and friends that have enriched my life,” Morrill writes. Bullard photographs will be displayed at Jacob Edwards Library for the month of February. An opening reception with Morrill will be held Thursday, Feb. 7, from 6:30 p.m. to 7:30 p.m. at Jacob Edwards Library, 236 Main Street, Southbridge. Morrill will give a presentation Thursday, Feb. 21 at 6:30 at Jacob Edwards Library as well. See also, exclusive to The Citizen Chronicle, Morrill’s overview and reflection on Bullard’s work (here). Also exclusive to The Citizen Chronicle, below, is a reflection and a list of the towns where Bullard took photos and a list of the chain of ownership of the collection of photographs, which include more than 5,400 negatives and a variety of photographs beyond the historic images seen in the exhibit. It was not until the collection of negatives was owned and catalogued by Morrill that the unique historical value was recognized and shared publicly. “William Bullard photographed the following communities (some extensively and some randomly). His complete collection comprises approximately 5,400 negatives. “Looking at the list surely makes it clear he spent considerable time on a bicycle, in wagons and trolleys and on trains. William was often seen traveling around the Brookfields on his bicycle with his photographic equipment strapped on the back. Not having a studio made it more difficult for him but it helped produce extraordinary, poignant and evocative ‘on location’ photographs. Frank Morrill, ownership of Bullard photographs 2003 – present. Responsible for cataloging, recording and making collection available to historians, academics and descendants.